Aalst (Dutch pronunciation: [aːlst]; French: Alost, Brabantian: Oilsjt) is a city and municipality on the Dender River, 31 kilometres (19 mi) northwest from Brussels in the Flemish province of East Flanders. 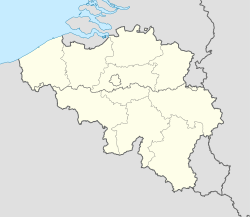 The municipality comprises the city of Aalst itself and the villages of Baardegem, Erembodegem, Gijzegem, Herdersem, Hofstade, Meldert, Moorsel and Nieuwerkerken. Aalst is crossed by the Molenbeek-Ter Erpenbeek in Aalst and Hofstade. The current mayor of Aalst is Christoph D'Haese, from the New-Flemish Alliance party. The town has a long-standing (folkloric) feud with Dendermonde (north along the river), which dates from the Middle Ages. Church of the beguinage, Aalst. Aalst on the Ferraris map (around 1775). The first historical records on Aalst date from the 9th century, when it was described as the villa Alost, a dependency of the Abbey of Lobbes. The development of a pre-urban village, grown around a Carolingian curtis on the westbank of the Dender, into a small urban centre must have taken place in the 11th or 12th century. During the Middle Ages, a town and port grew at this strategic point, where the road from Bruges to Cologne crossed the Dender. While it was within the Holy Roman Empire it was considered the capital of the province of Flanders. In 1046, Aalst was transferred to the Countship of Imperial Flanders, and absorbed a portion of Brabant, and in 1173 it was united with the remainder of the Flanders province. Its frontier position on the border of the Holy Roman Empire allowed the town to keep a certain degree of independence. Its relation with Brabant has been preserved in the city's white and red coat of arms, the colours of Lotharingia. Construction of the town hall began in the middle of the 12th century, making it the oldest surviving town hall in Belgium. Several manuscripts from this period still survive in the town archives. During the Hundred Years War the town of Aalst allied themselves with Louis de Male against Philip van Artevelde and sent troops in the victorious Battle of Roosebeke. The town hall, and the city itself, were almost entirely destroyed by fire in 1360. The town was soon rebuilt and a new belfry in gothic style was built in the 15th century. This was a time of great prosperity for the city, dominated by the powerful weavers' guild. It is also at that time that Dirk Martens, a local citizen, became the Southern Netherlands’ first printer, founding a printing shop in 1473 that published books by various authors including Christopher Columbus; Martens would later become a professor at the Old University of Leuven, and he was laid to rest in the Church of St. Marten. Aalst suffered considerably under the Eighty Years' War (1568–1648). It was later taken by the French Marshal Turenne in the War of Devolution of 1667, then occupied by France until 1706, when it became independent once more following the Battle of Ramillies, along with Southern Flanders in general. The textile-based economy flourished under the French. In the 18th century, the Austrians controlled the region. 1830 saw Belgium gain independence and Aalst became part of the country, this ended a long period, starting in 1056, of foreign control, by such as the Spanish, German, French, and the Dutch. The 19th century was marked by social crises engendered by the Industrial Revolution, with Father Adolf Daens and his Christene Volkspartij emerging as the local defender of workers' rights. This was in response to Rerum novarum, which established worker rights. However Daens felt this did not do enough. Eventually, he was made to pay for his "splinter movement". In the Pre-World War II years, the fascist movement in the Low Countries gained momentum, with the Vlaamsch Nationaal Verbond (Flemish National Front) becoming established in the region. Aalst, along with Brussels and Antwerp were the strongest subscribers to this line of thought. The 20th century was marked by bombardment and occupation by the Germans during both world wars. The textile industry is still vibrant in Aalst, in part because of the French occupation. Aalst produces not only the textiles themselves, clothing and footwear, but manufactures many of the needed machines. The more rural regions are noted for their production of hops, which are sold to the old breweries there. They also have a large active cut flower business in the region. Aalst is famous for its carnival festivities, celebrated every year before Lent. During this celebration, the former town hall belfry is the site of the traditional "throwing of the onions". A Prince Carnival is elected, who is allowed to "rule" the city for three days. A big parade crosses the city on Sunday, with about 70 groups of costumed volunteers and parade cars. Carnival Tuesday or Shrove Tuesday (by tradition, the day before Ash Wednesday), is known as the day of the 'Voil Jeannetten' (literally: "the Dirty Jennies"), i.e., men dressed as women. The festivities traditionally end with the "Burning of the Doll", happening on Tuesday evening. In 2019, the city was involved in controversy. A float depicted two huge, snarling Orthodox Jews with huge hook noses and beards, wearing shtreimels (the fur hats worn by some Hassidic Jews), standing amid gold coins and bags of money, One of the Jews has a rat on his shoulder. In the back is a synagogue with a mezuzah on the doorway. The title of the float was “Sabbath Year.” . The 15th-century belfry next to the town hall contains a 52-bell carillon, the oldest in Belgium. Together with the adjacent Aldermen's House, it was classified by UNESCO as a World Heritage Site in 1999 (part of Belfries of Belgium and France). The famous "unfinished" St. Martin's Collegiate Church, in Gothic style, dates back to 1480. It contains a painting by Rubens, "Saint Roch beseeching Christ to terminate the Plague at Aalst", and it has also a tabernacle (dated 1605), which features sculptures made by Hiëronymus Duquesnoy the Elder, whose most famous creation is Manneken Pis. This church was damaged in 1914. The statue of Dirk Martens (1450–1534), first printer in the Netherlands. The old breweries that produce their own hops. The Town square has a gallery with a second statue of Martens along with Charles V.
Description: A rectangle of proportions 2:3, with three vertical bands of red, white and yellow, with a red sword in the middle band pointing upwards. In Dutch: "Drie even lange banen van rood, van wit en van geel, met op het wit een rood zwaard paalsgewijze geplaatst." Heraldic blazon: Terciated by pale Gules, Argent and Or, a sword of the first pointing upwards. Those arms were granted in 1819 and confirmed on 6 February 1841. The oldest known seals of Aalst (13th–14th centuries) show a knight holding a sword in one hand and the Flemish banner in the other, but there is a seal dated 1237 showing the banner with the sword, and even an older seal, dated 1174, with the same features. A later version of the seal (1339–1559) shows a local banner with the sword. A seal from 1407 adds a small shield with the Flemish arms. The arms of Aalst were first shown in the roll of arms of Gaillard (1557). The sword is probably taken from the old seal with the knight. The two shields show the Imperial eagle and the Flemish lion, recalling the odd status of the Country of Aalst. Description: The municipal arms of Aalst show on the chief of a white shield two smaller shields separated by a red sword pointing upwards and dividing the whole shield; on dexter, the shield is yellow with a black double-headed eagle with red tongues and claws (Holy Roman Empire); on sinister, the shield is yellow with a black lion with a red tongue and claws (Flanders). Heraldic blazon: A Modern French shield Argent ensigned by a crown Or and divided in half by a sword palewise pointing upwards Gules between two smaller shields Or; on the dexter shield, a double-headed eagle displayed; on the sinister shield a lion rampant; both Sable armed and langued Gules. the football club Eendracht Aalst who play in the second division. the volleyball club VK Aalst, which was founded in the 1960s, playing in the first division. Anon (2014). "From Then til Now". www.brabantia.com. Archived from the original on August 2, 2014. Retrieved August 2, 2014. Anon (2014a). "Twin Towns". Gabrovo Municipality. Archived from the original on August 2, 2014. Retrieved August 2, 2014. Blanjean, Lucienne (1997). "Aalst". In Johnston, Bernard (ed.). Collier's Encyclopedia. I: A to Ameland (1st ed.). New York, NY: P. F. Collier. Canby, Courtlandt (1984). "Aalst". In Carruth, Gorton (ed.). The Encyclopedia of Historic Places. I: A-L. New York, NY: Fact on File Publications. ISBN 0-87196-126-1. Clough, Shepard B. (1946) . "IX: The Flemish Movement". In Goris, Jan-Albert (ed.). Belgium. The United Nations. Berkeley, CA: University of California Press. ASIN B001VSF64A. Cohen, Saul B., ed. (1998). "Aalst". The Columbia Gazetteer of the World. New York, NY: Columbia University Press. ISBN 0-231-11040-5. Cook, Bernard A. (2004). Belgium: A History. Studies in Modern European History. 50. New York, NY: Peter Lang Publishing, Inc. ISBN 0-8204-5824-4. Hoiberg, Dale H., ed. (2010). "Aalst". Encyclopædia Britannica. I: A-Ak - Bayes (15th ed.). Chicago, Illinois: Encyclopædia Britannica, Inc. ISBN 978-1-59339-837-8. Munro, David, ed. (1995). "Aalst (Alost)". The Oxford Dictionary of the World. Oxford, UK: Oxford University Press. ISBN 0-19-866184-3. Ogrizek, DoreÌ (1961) . Belgium and Luxembourg. The World in Color. ASIN B0007H5COK. Young, Margaret Walsh; Stetler, Susan L., eds. (1987). "Belgium". Aalst. Cities of the World. 3: Europe and the Mediterranean Middle East (3rd ed.). Detroit, MI: Gale Research Company. ISBN 0-8103-2541-1. Wikimedia Commons has media related to Aalst, Belgium. Wikivoyage has a travel guide for Aalst. This page was last edited on 11 April 2019, at 23:30 (UTC).